Despite these ordinary behaviors, these siblings are quite extraordinary: Inganda and Inguka are the first twins born to habituated western gorillas in the Dzanga-Sangha Protected Areas complex in the Central African Republic (CAR). Western lowland gorillas like Inganda and Inguka are Critically Endangered. They face serious threats from poaching, disease and habitat loss across Central Africa. To protect these gorillas and their forests, WWF and the government of the CAR launched the Primate Habituation Program in the Dzanga-Sangha Protected Areas in 1997. 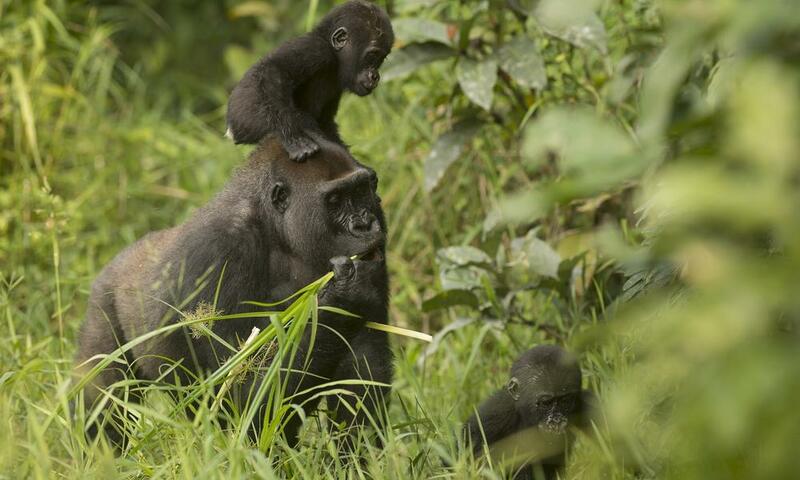 Together, we work to habituate gorillas for tourism and research. Habituating great apes to human presence is important for conservation as it not only increases scientific knowledge and understanding of the species, it can also generate funding for conservation activities and revenue for local economies, strengthening the link between conservation and communities. To date, the program has successfully habituated three western lowland gorilla groups while two additional groups are presently undergoing habituation. The program is also a major source of employment for local people. This includes indigenous Ba’Aka people hired as trackers and Bantu people working as guides. Today, the Primate Habituation Program is considered one of the most successful Western Lowland Gorilla tourism and research programs in Central Africa. Meanwhile, Iganda and Inguku continue to explore the world around them. Inganda seems to be his mother Malui’s preferred twin—or maybe just the weaker one—and spends most of his time riding on her back. Inguka, on the other hand, has gained his position within the group, staying close to the silverback and interacting with other group members. Inguka is most often on the ground and can climb to nearly 100 feet without assistance. The twins’ older siblings have played a great role in raising Inguka, making the job easier for Malui. “Every day with the gorillas is special,” says Terence. Though Western gorilla populations are declining, the mountain gorillas’ story offers hope for the species and its forest home.